John 14:2 In my Father's house are many mansions: if it were not so, I would have told you. I go to prepare a place for you. 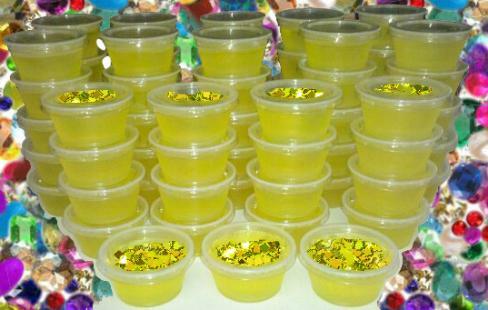 Just make up some yellow jello and pour into little mini plastic cups. Make as many as you need. 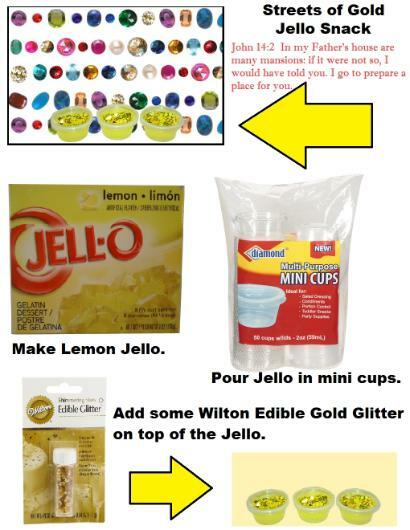 You could add edible gold glitter to the top of the jello after it's set up if you wanted. You could leave this off if you don't have any. The yellow jello still looks like streets of gold even if it don't have glitter on it. Revelation 21:13 On the east three gates; on the north three gates; on the south three gates; and on the west three gates. Revelation 21:14 And the wall of the city had twelve foundations, and in them the names of the twelve apostles of the Lamb. Revelation 21:15 And he that talked with me had a golden reed to measure the city, and the gates thereof, and the wall thereof. Revelation 21:16 And the city lieth foursquare, and the length is as large as the breadth: and he measured the city with the reed, twelve thousand furlongs. The length and the breadth and the height of it are equal. Revelation 21:17 And he measured the wall thereof, an hundred and forty and four cubits, according to the measure of a man, that is, of the angel. Revelation 21:18 And the building of the wall of it was of jasper: and the city was pure gold, like unto clear glass. Revelation 21:20 The fifth, sardonyx; the sixth, sardius; the seventh, chrysolite; the eighth, beryl; the ninth, a topaz; the tenth, a chrysoprasus; the eleventh, a jacinth; the twelfth, an amethyst. Revelation 21:21 And the twelve gates were twelve pearls; every several gate was of one pearl: and the street of the city was pure gold, as it were transparent glass. Revelation 21:22 And I saw no temple therein: for the Lord God Almighty and the Lamb are the temple of it. Revelation 21:24 And the nations of them which are saved shall walk in the light of it: and the kings of the earth do bring their glory and honour into it. Revelation 21:25 And the gates of it shall not be shut at all by day: for there shall be no night there. Revelation 21:26 And they shall bring the glory and honour of the nations into it. Revelation 21:27 And there shall in no wise enter into it any thing that defileth, neither whatsoever worketh abomination, or maketh a lie: but they which are written in the Lamb's book of life.